Unfortunately, isolation among seniors is alarmingly common, and will continue to increase in prevalence as the population grows. Learn how to help your loved ones stay healthy by reading more on the top ways to help seniors avoid isolation. Considering the demonstrated risks and the increasing prevalence of this issue, it’s certainly worth addressing how we can promote social integration among our older loved ones, and even ourselves – for it has been shown that family caregivers are themselves at a high risk of social isolation. Lack of adequate transportation is a primary cause of a social isolation. Because many seniors do not drive, this is a big issue for them, so anything that helps seniors get around and make independent choices about travel promotes their social health. Creating a solid public transportation infrastructure and providing special transportation options to seniors and disabled people will help promote their social integration. For example, our blog recently reported that giving free buses to seniors promotes their health. Family offering rides to older loved ones and helping them to learn to use public transportation will also help them maintain social connections and a healthy sense of independence. For seniors who have been regular churchgoers, this weekly social connection has been shown to be quite beneficial. Nicholson’s review observed that many studies have shown the benefits of churchgoing for seniors: “Those frequently attending religious services have been found to have lower mortality rates than those with infrequent attendance.” Older church goers not only benefit from the social interaction and sense of purpose that weekly worship provides, but they also benefit from the watchful eye of other churchgoers, who are likely to recognize a decline in an isolated senior that may have gone unnoticed otherwise. Many experts note that the act of nurturing can relieve feelings of social isolation. In the peer reviewed paper “Emotional Benefits of Dog Ownership,” Eve Beals succinctly outlines the benefits of nurturing a pet: “Pet owners remain engaged socially, have less depression, suffer less loneliness, feel more secure, have more motivation for constructive use of time and require less medication than non-pet owners. Animal companionship facilitates establishing friends, is a social lubricant, gives a reason to get up in the morning and is an icebreaker.” Obviously, you would need to make certain that the senior is capable and willing to properly care for the pet before giving a pet as a gift. Assuming the senior is capable of caring for a pet, nurturing and caring for an animal companion can be quite beneficial. Even tending a garden can satisfy our nurturing drive, so giving a senior a plant or gardening supplies as a gift can be beneficial too. Nicholson’s review notes that some research has shown that many older adults avoid social interaction because of a poor body image. “Individuals with a poor body image attributable to being overweight may decrease or cease interactions with their social networks to the point where they could be at risk for social isolation. For example, individuals who are overweight may be self-conscious or embarrassed, and, therefore, less likely to engage in their social networks.” Compliments and positive comments can go a long way to boosting the self-esteem of seniors. Similarly, discouraging seniors from fretting over their appearance or catastrophizing the cosmetic effects of aging may help them avoid becoming self-conscious to the point that they avoid social interactions. For seniors who are genuinely overweight, addressing the root problem by encouraging weight loss through healthy eating and exercise can be helpful too, but always be positive and sensitive in efforts to encourage older loved ones to lose weight. Seniors with undiagnosed or untreated hearing problems may avoid social situations because of difficulty communicating or embarrasment. Encourage seniors to have their hearing checked and hearing problems treated. A hearing aid may be the only barrier between a senior and better social health. Vision tests are important too as sight problems “limit opportunities for social interactions with others” according Nicholson’s landmark review on social isolation research. The act of eating with others is inherently social. In “Food and Eating: An Anthropological Perspective,” Robin Fox writes that eating is “a profoundly social urge. Food is almost always shared; people eat together; mealtimes are events when the whole family or settlement or village comes together. Food is also an occasion for distributing, giving and sharing for the expressing of altruism, whether from parents to children, children to in-laws, or anyone to visitors and strangers.” Encourage seniors to share a meal with others whenever possible, whether it’s with a church group, the local senior center, or a friendly café or diner. Dining with others is also likely to help promote better nutrition, which is crucial for the elderly. Often family members will be the first to notice when social isolation is affecting a senior’s well-being, but not all seniors have the benefit of loved ones who live nearby and can check on their well-being. For this reason, public health professionals should be on the lookout for signs of social isolation problems in their clients and patients so that appropriate interventions can be arranged. After all, nothing can be done to help socially isolated seniors if no one recognizes that they are socially isolated. 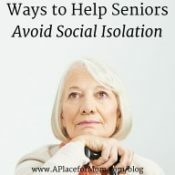 Beck Squires notes in an article for AARP that health professionals should be especially aware of social isolation in particular groups of older adults, such as gay and lesbian seniors who are unlikely to have grown-children who can help oversee their well-being or spot signs of social isolation. Family caregivers who are helping to care for an elderly loved one probably don’t consider themselves seniors and are also probably more concerned about the social well-being of the person they are caring for than their own social well-being. But many caregivers are 50+ and caregiving itself can actually trigger social isolation. In Squires’ AARP article, she summarizes the social and health risks of caregiving: “Caregivers often work by themselves, and more than half (53%) say they have less time for friends and family. All too often, they don’t call doctors when they are sick, and they have little or no time to exercise or eat well. Studies show that up to 70% of caregivers have clinically significant symptoms of depression.” If you are a caregiver, remember to take care yourself. It’s not just the person you are caring for who’s at risk of social isolation, it is you. And if you know a caregiver, or a loved one in your family shoulders the burden of caregiving for an elderly family member, take whatever steps you can to make that person’s life easier and to allow them to have a social life of their own.